It seemed that they were the never ending blocks. I sewed round after round, but they never seemed to get any bigger. Finally after three full days of sewing, my Bonnie and Camille Log Cabin Block Swap blocks are complete and in the mail - with two days to spare on the October 1 deadline. I loved the look of these wonky log cabin blocks when Moda Lissa - Lissa Alexander, Director of Marketing at Moda - started sharing photos of her log cabin block swap this summer on Instagram. She invited her Moda designer friends to make red, white and blue blocks, cut them up and swap them with each other to create quilts. So when I saw that an Instagram log cabin block swap was happening using Bonnie and Camille fabric, I couldn't resist. 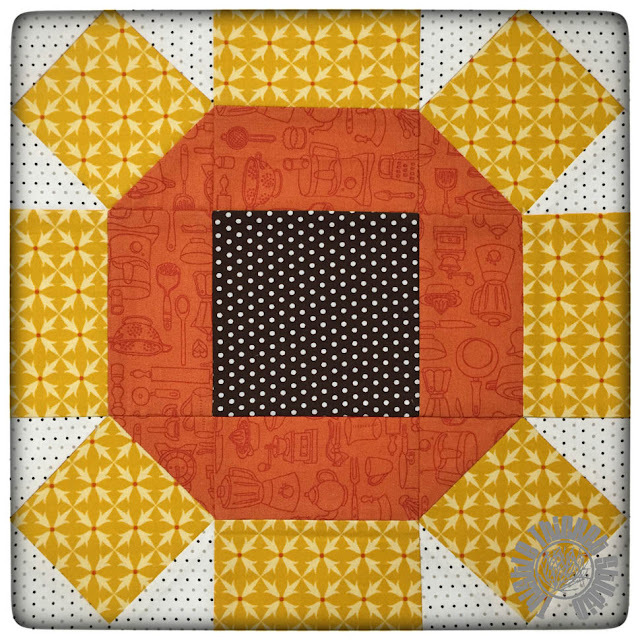 I have never participated in a block swap, but decided I was up to the challenge. 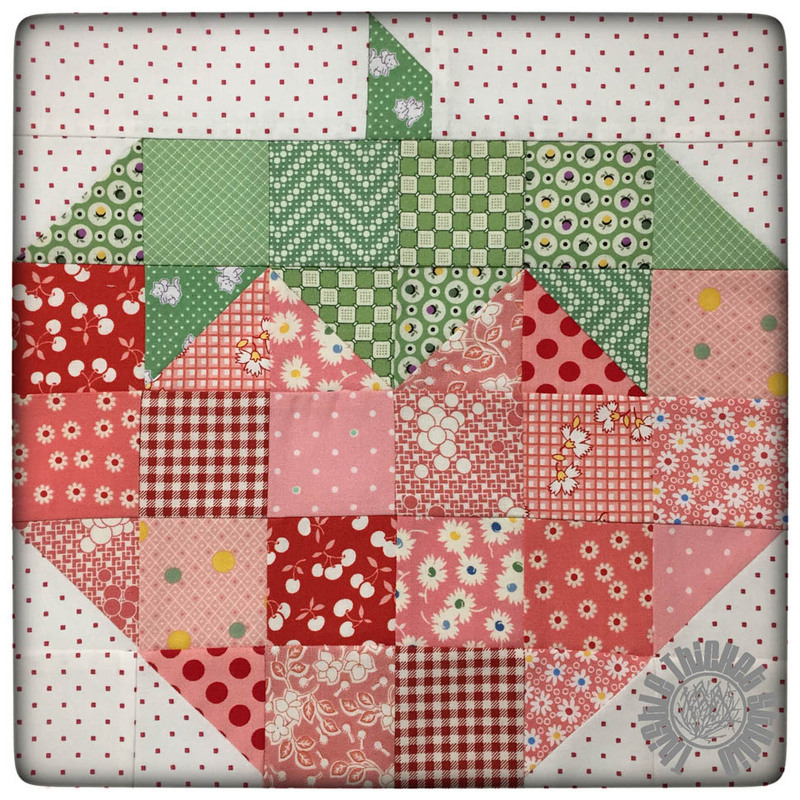 The block starts with a 5" square - I used a charm pack of Hello Darling by Bonnie and Camille. Strips of varying widths (1" to 2 1/2") are sewn around the center square to form the log cabin. 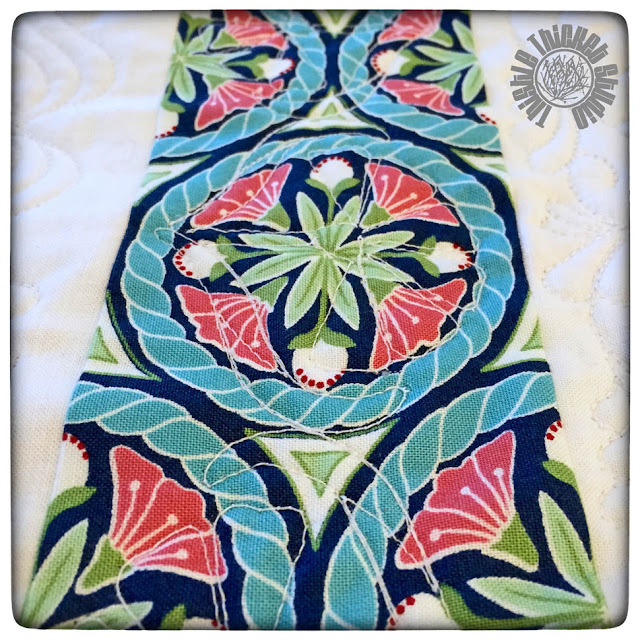 I used a jelly roll of Miss Kate and one of Hello Darling. Strips are added until the block is slightly larger than 16 1/2", at which point they are squared up to 16 1/2". A final round of 2 1/2" strips are added to make the final block 20 1/2" square. Then the block is cut both vertically and horizontally down the center to create four quarter blocks. The block instructions are found in the book "Sunday Morning Quilts" by Amanda Jean Nyberg and Cheryl Arkison. I made a total of 12 big blocks. 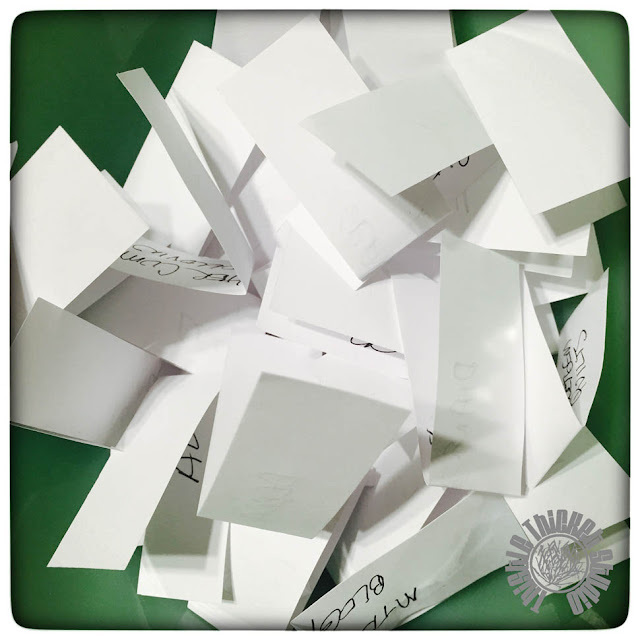 After cutting, I kept one square from each block and the other 36 remaining blocks were mailed to the swap hosts, who will mix the blocks all up and redistribute 36 blocks back to each of the participants. 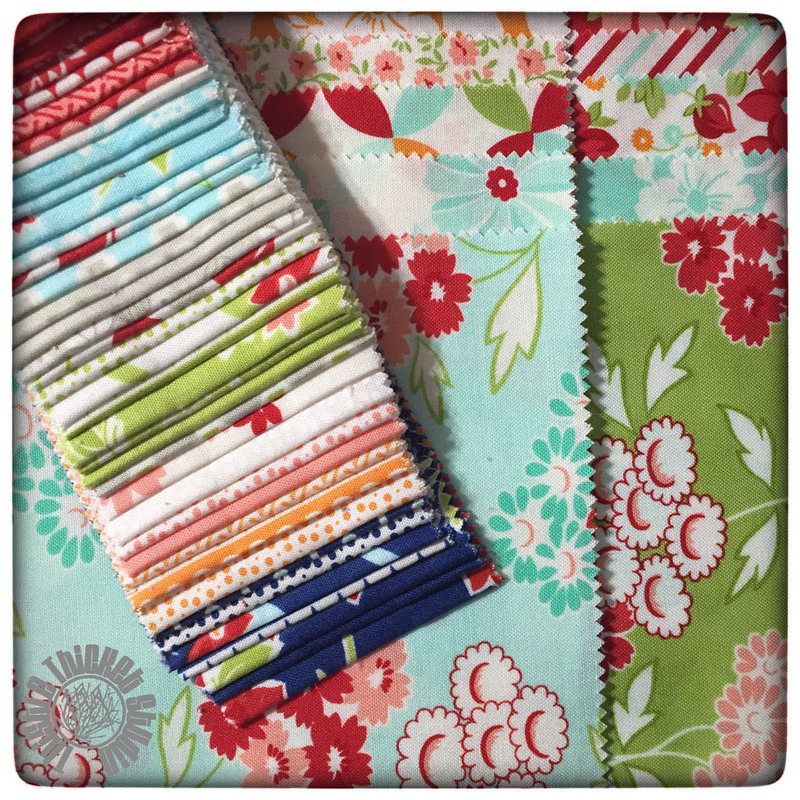 I'm excited to see what fabrics are in the blocks I get back. I also like blocks with a good variety of fabric widths in the strips, so hopefully I'll get back blocks that will create really wonky finished log cabins. 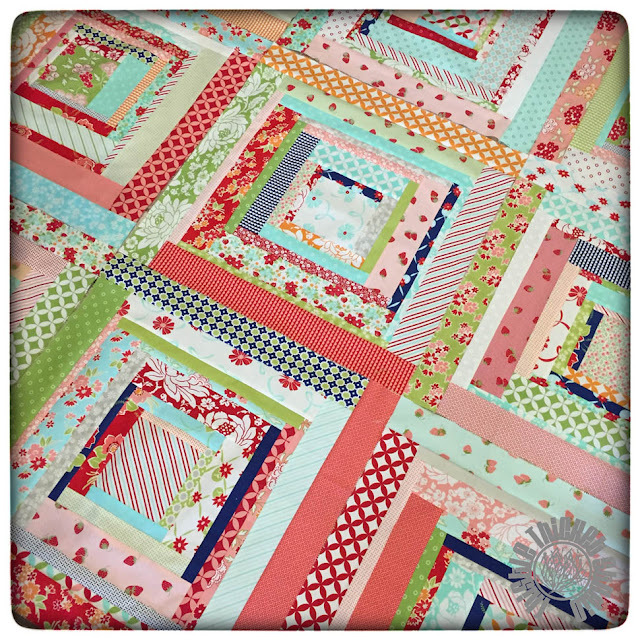 I do think that the uncut large blocks would make a very pretty quilt too! This would be a great scrap busting quilt. 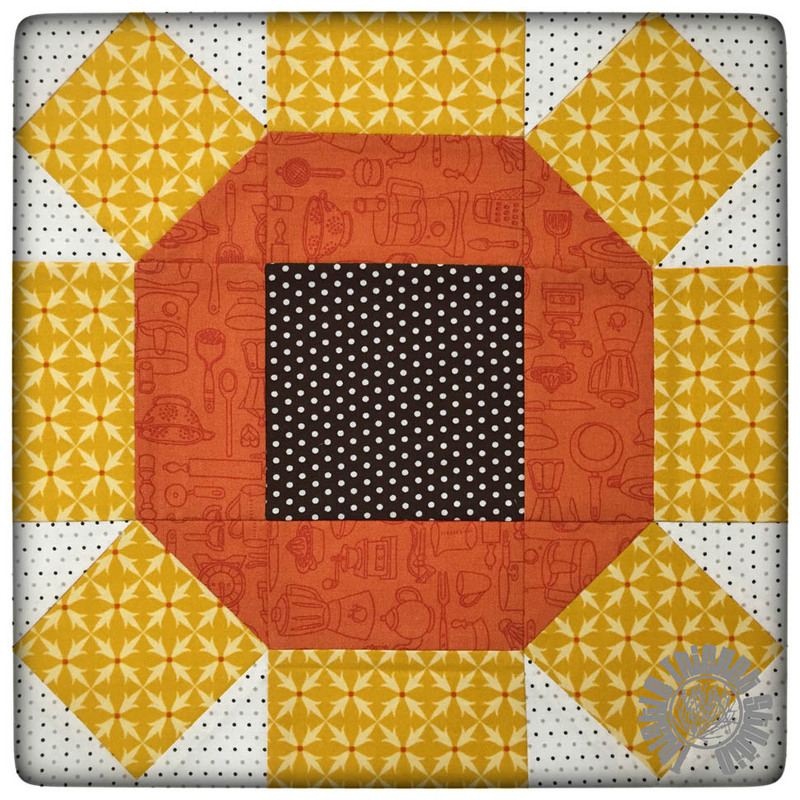 I have seen a couple of different layouts from this block swap, so I may have to make more than one - yup, another idea to add to that never ending to-do list! 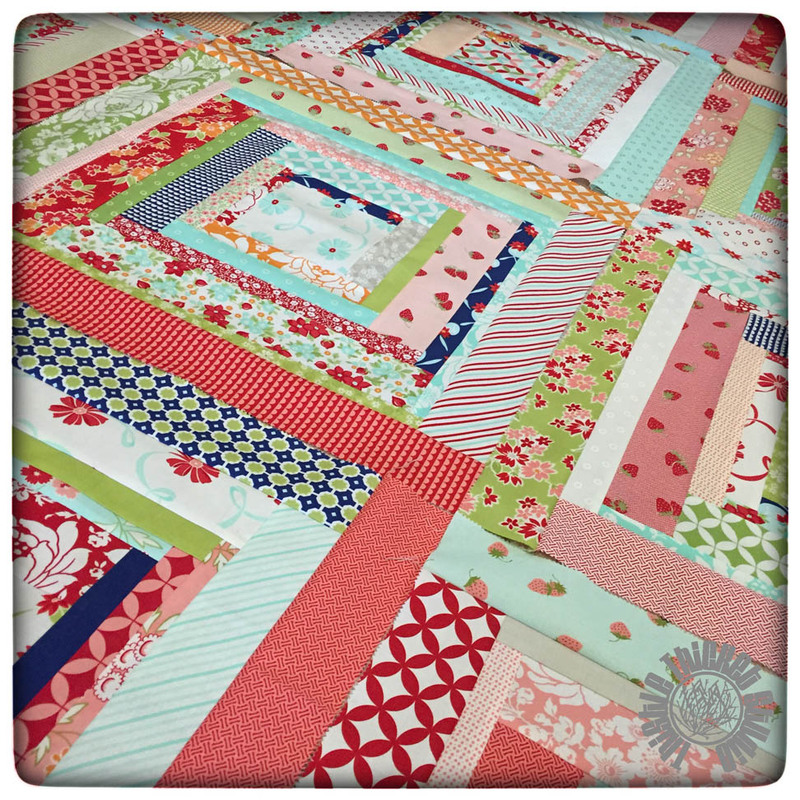 Are you participating in the Bonnie and Camille Log Cabin Block Swap on Instagram? Give me a shout out! Have you seen a cool layout using this log cabin block technique? Please share a picture or website addy! Congratulations to Dawn, commenter #17! She is the winner of Lori Holt's new Seams Sew Easy notion in my Farm Girl Vintage Sew Along giveaway sponsored by the Fat Quarter Shop! 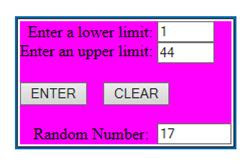 The winner was picked using an online random number generator. 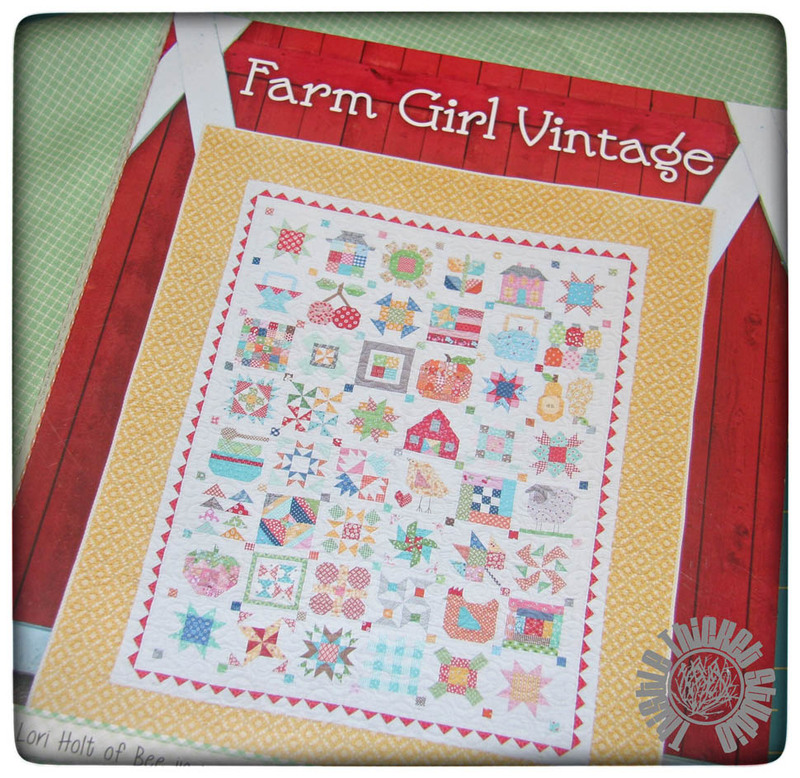 Thank you to everyone who visited the blog for my stop on the Farm Girl Vintage Sew Along. Each Friday since May, Lori has been showing two blocks from her new book called "Farm Girl Vintage" and sharing ideas of how to use those blocks in all sorts of creative ways on her blog Bee In My Bonnet. 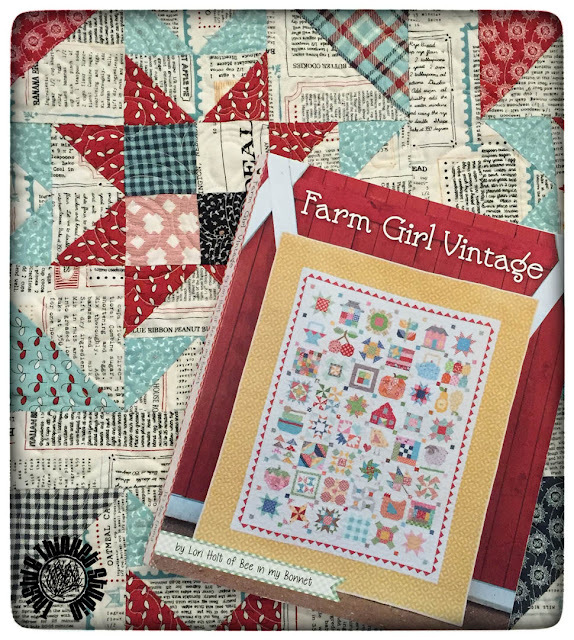 You can order the "Farm Girl Vintage" book and Lori's cute, cute fabrics and notions from the Fat Quarter Shop. 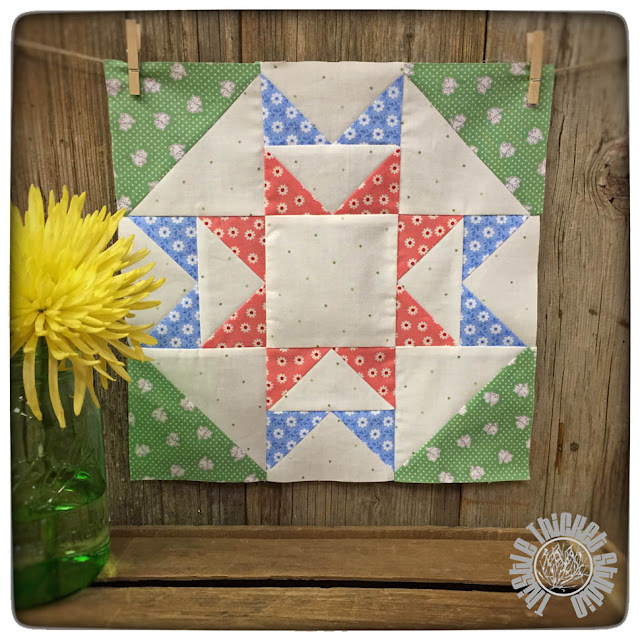 I have so thoroughly enjoyed this sew along because Lori has made each block so easy to make. And the Water Turn block is no different. 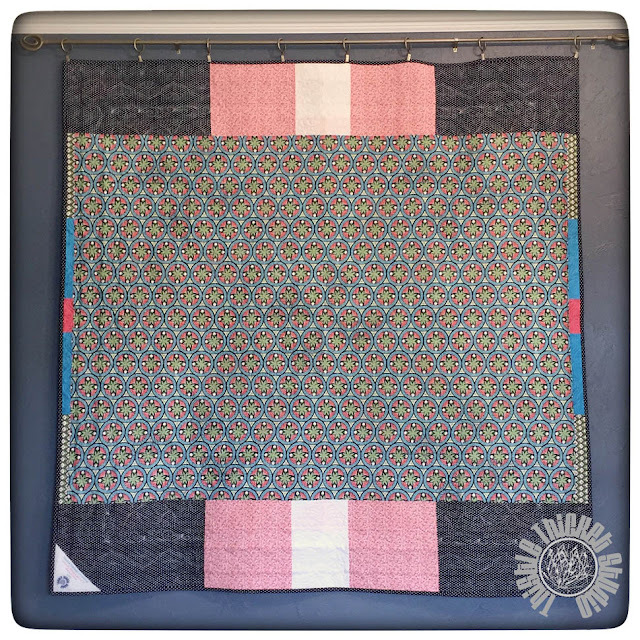 This block was so fun to make, I couldn't stop at just one, so I decided to make a whole quilt featuring this block using a stash of fabric and precuts I had tucked away of Feed Company by Sweetwater. Chain piecing the flying geese for this block was a wiz! I wish I would have read the recipes on this text print in the Feed Company line before I cut it all up! I did a 'mash up' - as Lori calls it - of blocks in my quilt, adding a four-patch block in the center of my Water Turn block. 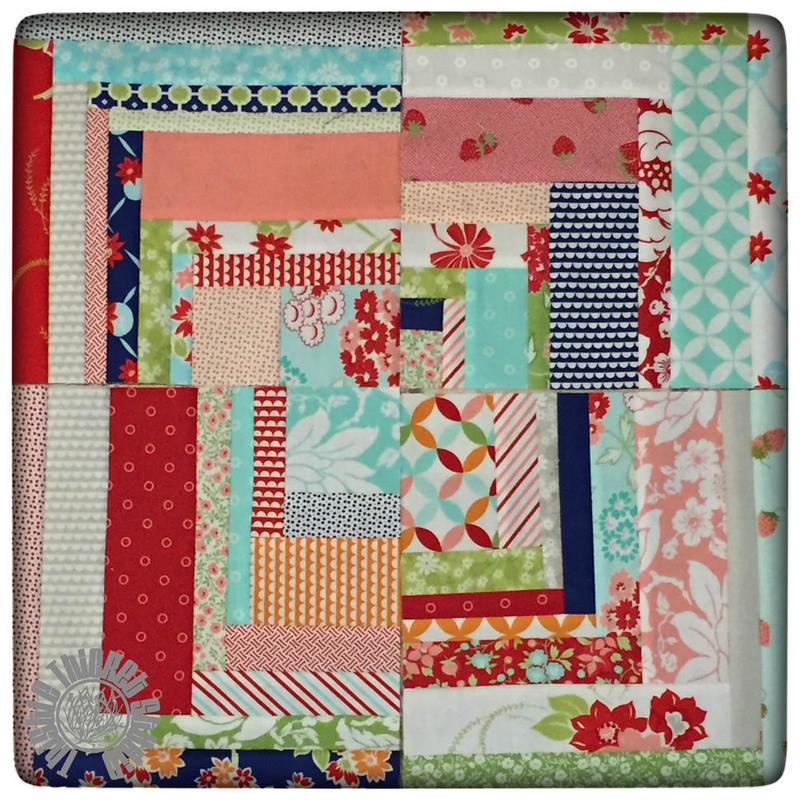 I used a Moda Candy pack for the four-patches and a charm pack for the half square triangle corners of the block to make it scrappy. 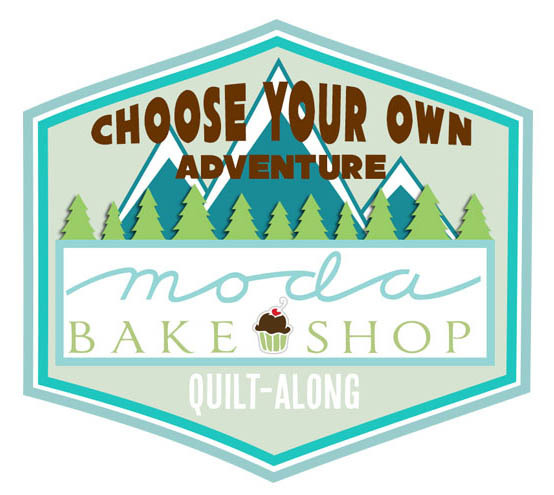 Then I printed my logo on a printable fabric sheet to turn an extra block into a label for the back of my quilt! I added sashing and corner stones between the blocks. 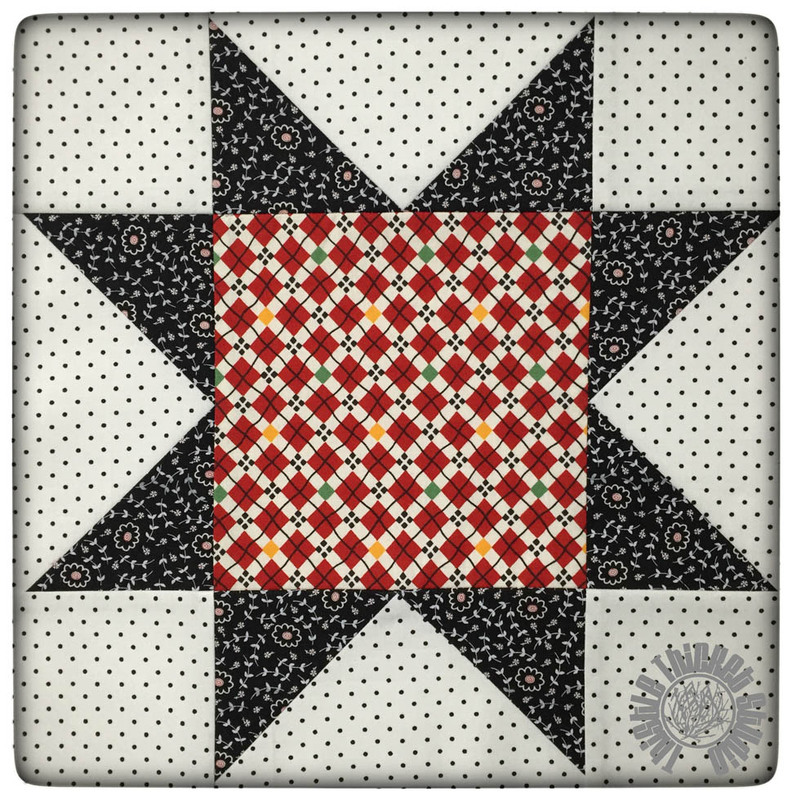 I love how the HSTs and the corner stones create a secondary pattern in this quilt. I also love a good plaid for binding, don't you? It's wheat planting time on our farm and we use an auger to remove the seed wheat from the bins. 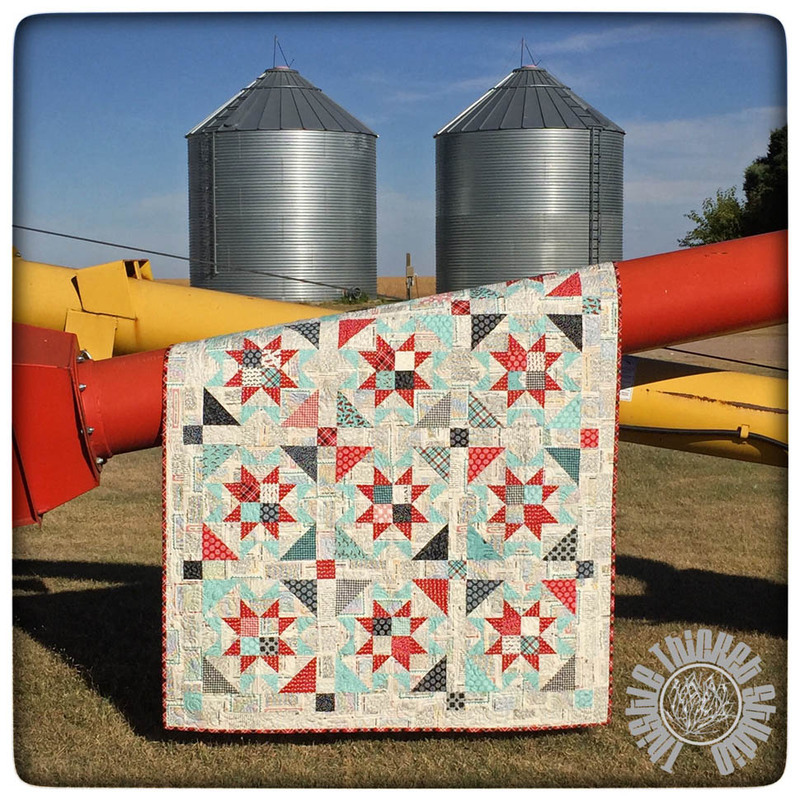 Perfect setting to feature this Farm Girl Vintage quilt! 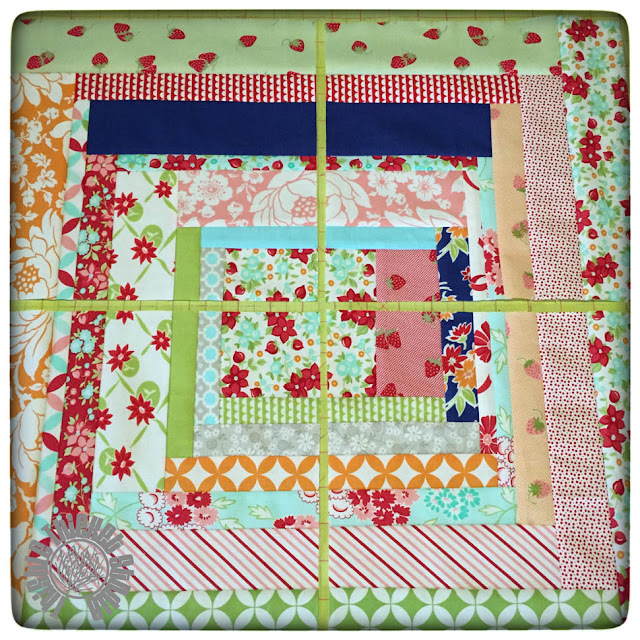 I used the left over charm squares in the backing. I love the back almost as much as the front! 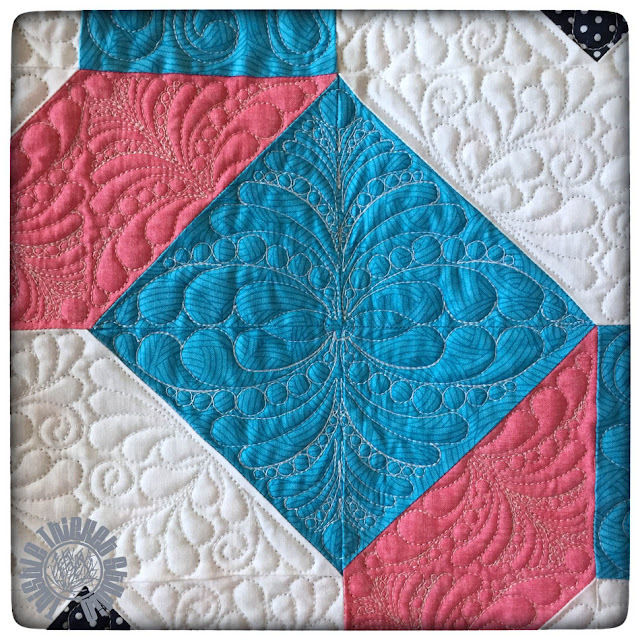 And I love how the quilting shows up in this photo! You know what the reward for making it all the way down to the end of this post? A Giveaway! 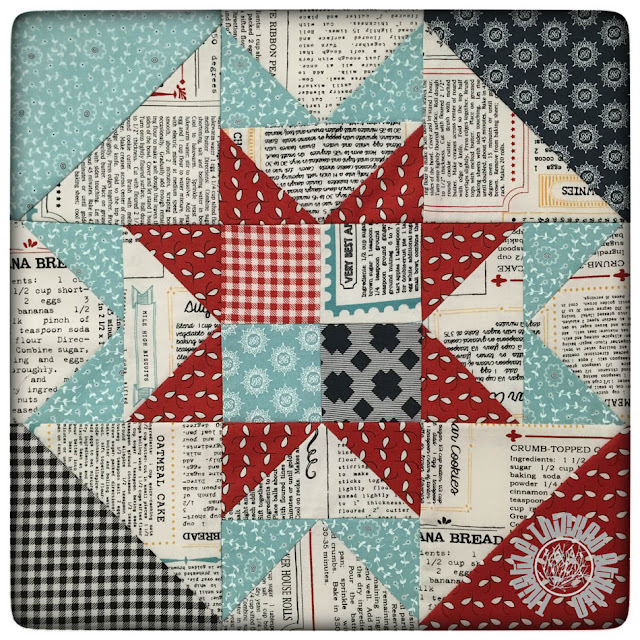 Leave a comment below on what kind of extra project you would make using "Farm Girl Vintage" blocks for a chance to win one of Lori's new "Seams Sew Easy" notions from the Fat Quarter Shop! Giveaway will close on Sunday evening, September 27th, at midnight Eastern time and I'll select a winner Monday using a random number generator. 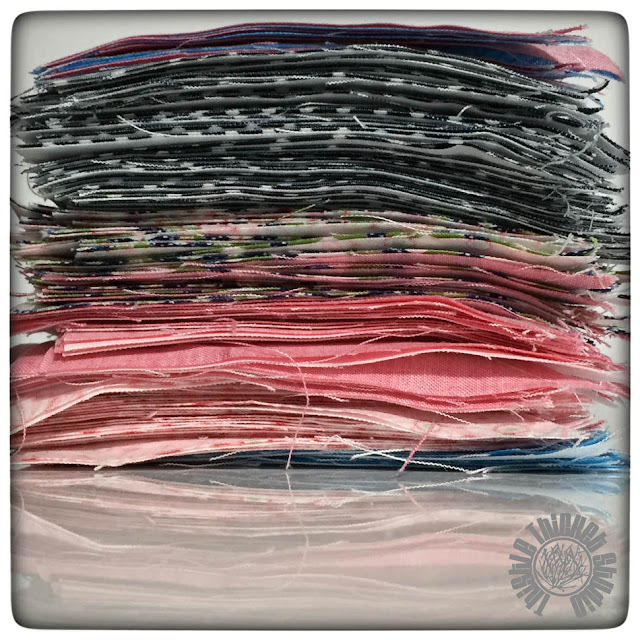 Lori Holt designed her Seams Sew Easy for an accurate 1/4" seam and for constructing easy corner triangles. 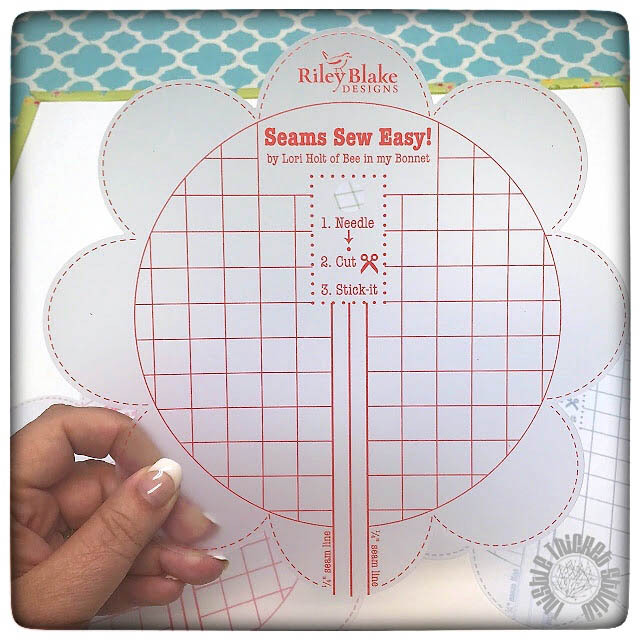 This tool saves time by not having to mark lines on your fabric when sewing half square triangles, flying geese or snowballs. 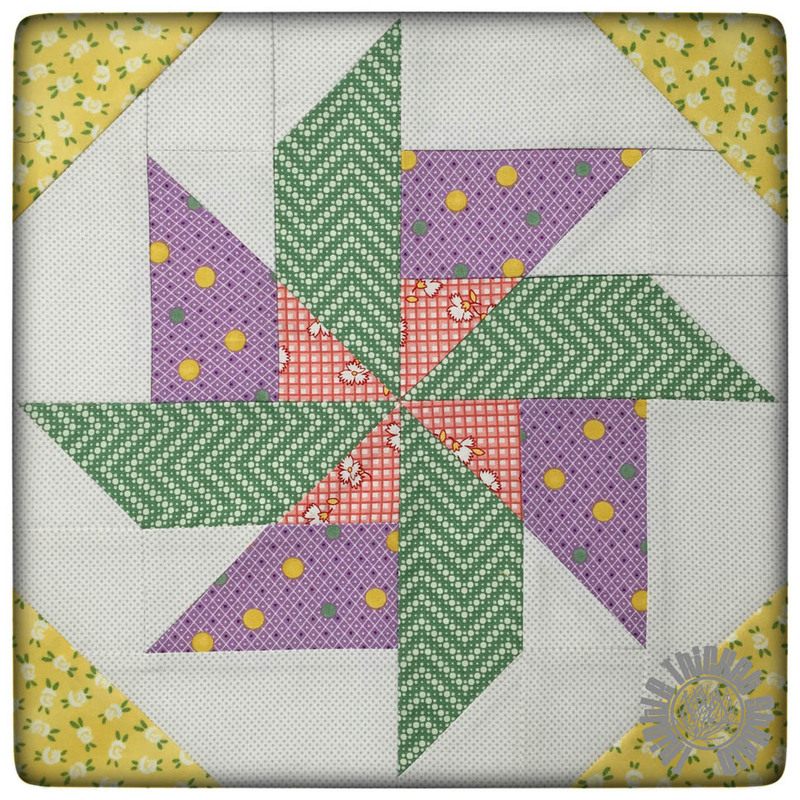 The center circle of the guide is also marked with 1/2" grid lines for a wider seam allowance. This is a seam guide that temporarily adheres to the bed of any sewing machine. These grid lines also help to ensure correct placement when adhering to your sewing machine bed. 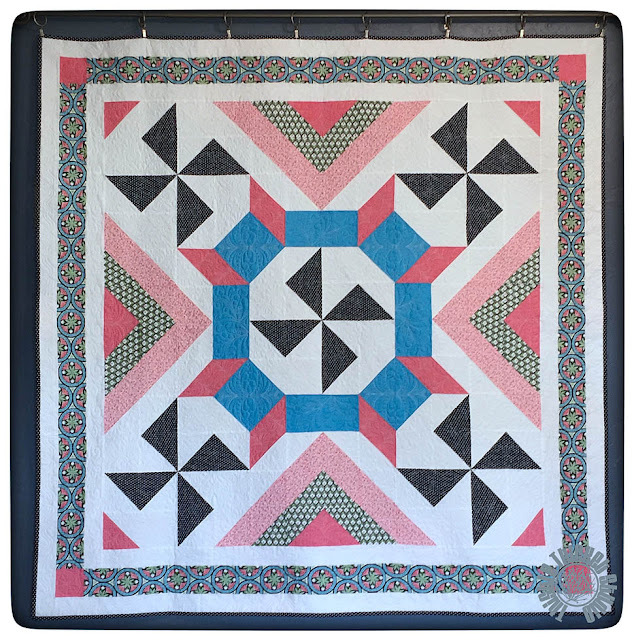 I want to thank Lori Holt for all the quilty fun this sew along has brought me and the Fat Quarter Shop for sponsoring my giveaway. And all of you for stopping by! Lori has a new sew along planned for January - I can't wait! P.S. Be sure to stop by Why Not Sew and check out the other Farm Girl Vintage block featured this week! 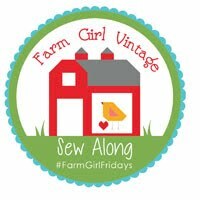 My turn on the Farm Girl Vintage Sew Along blog hop is inching closer - it's this Friday!!! And you'll want to be sure to stop back by to visit then because there will be an awesome giveaway sponsored by the Fat Quarter Shop!!! If you don't know, the Fat Quarter Shop published Lori Holt's Farm Girl Vintage book and they carry Lori's other books and patterns, plus her notions and fabrics. 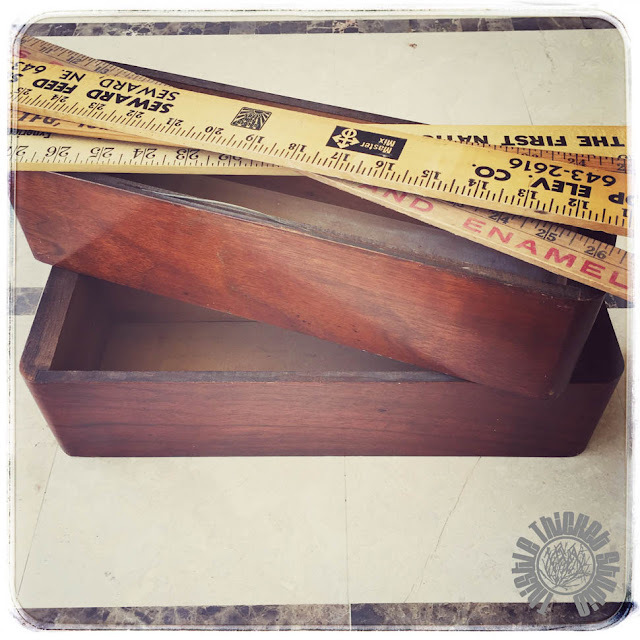 With my turn on the FGV blog hop this week, it signals that the end is near for this sew along - there's only two more weeks left. It really has been so fun. Lori is planning another sew along starting in January, can't wait to see what it is. I bought fabric last year for her 'Have Yourself A Quilty Little Christmas' sew along on Instagram, but didn't get to it before the holidays. 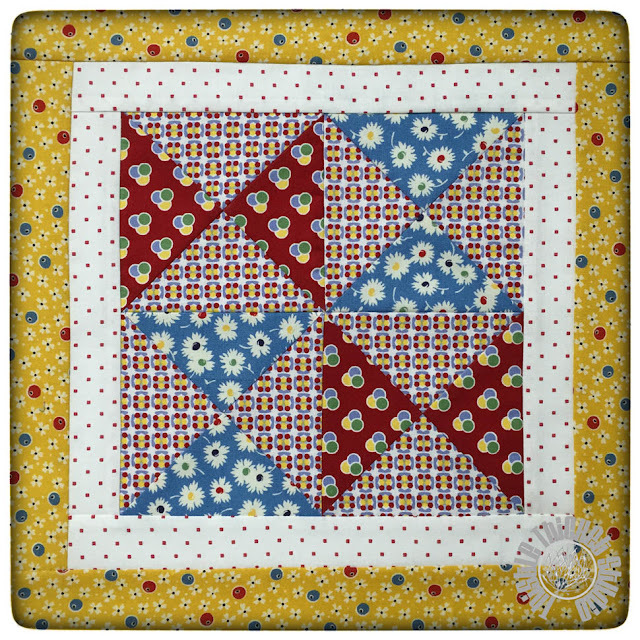 That is on my list to make after I get my Farm Girl Vintage quilt finished. 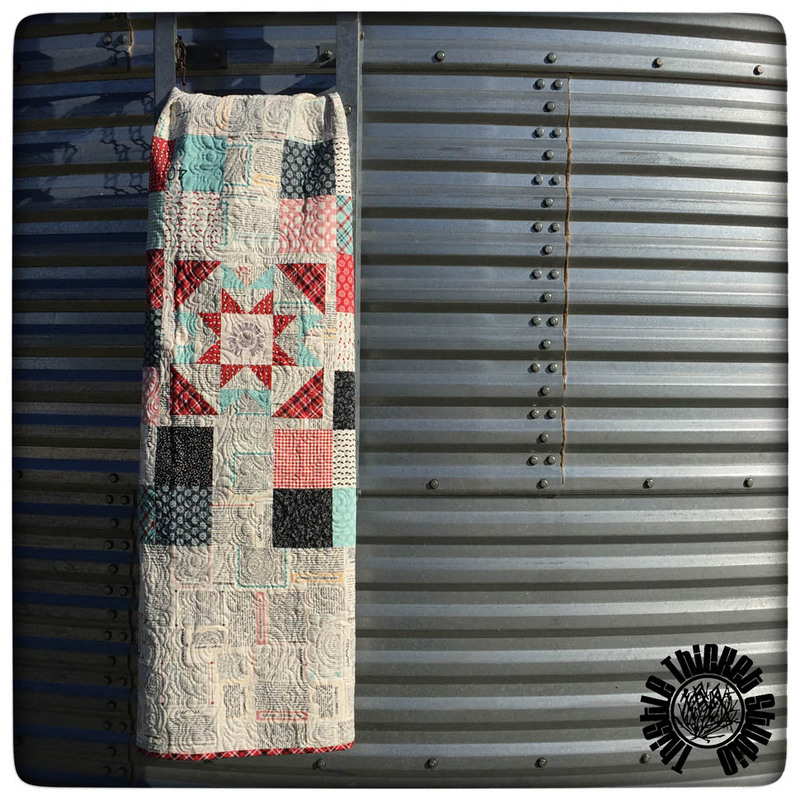 Oh, and a 'Welcome to the Farm' quilt to hang on our barn on special occasions using the barn, tractor, crops and other blocks from the book. And a sunflower table runner. And...... Well, you get the idea! And the Sunday Morning block. 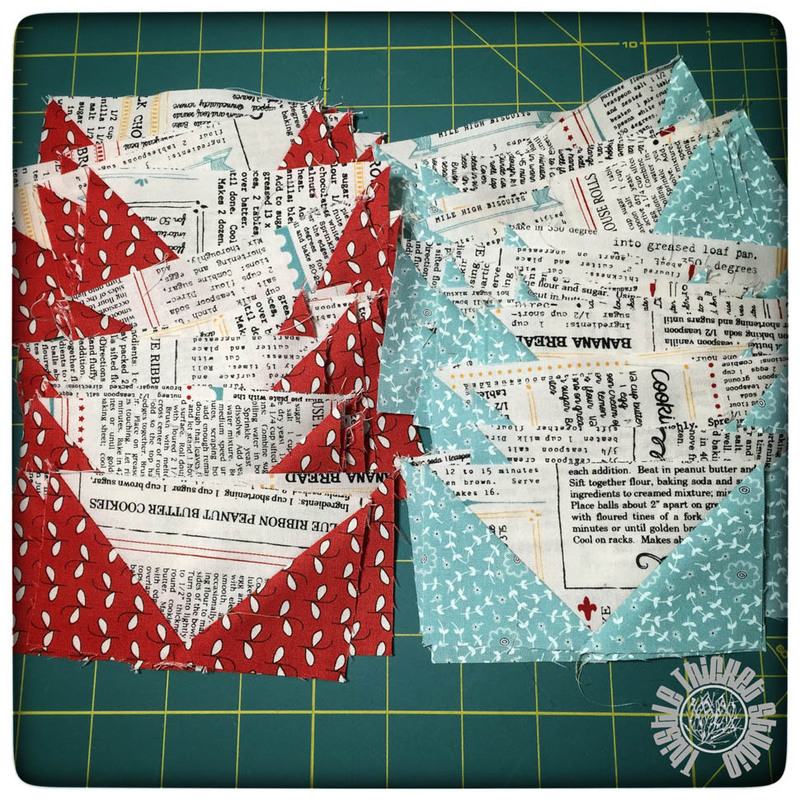 These next two blocks were my first choices of blocks for the blog hop, but they were both taken. But really, shouldn't a Kansas farm girl have made the Sunny Sunflower block?! 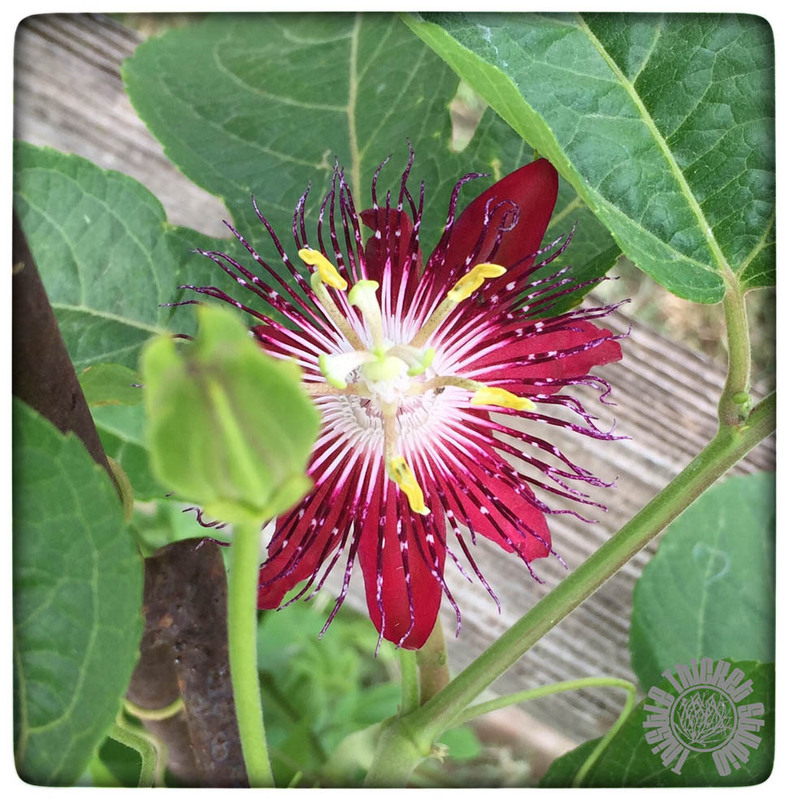 I mean, it is our state flower! 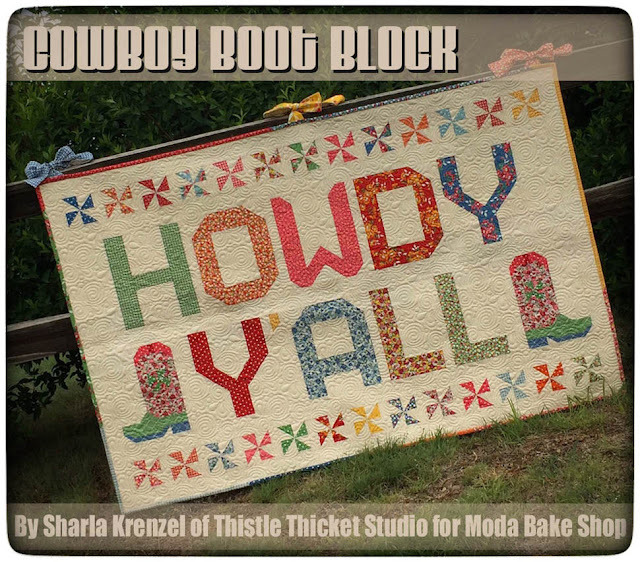 Or, shouldn't a blog called Thistle Thicket Studio have featured the Tumbleweed block? Did you know that a tumbleweed is really a Russian Thistle? And we have lots of them - no matter what you call them - here in western Kansas! A whole thicket full, in fact! Ha! Hence, the name. 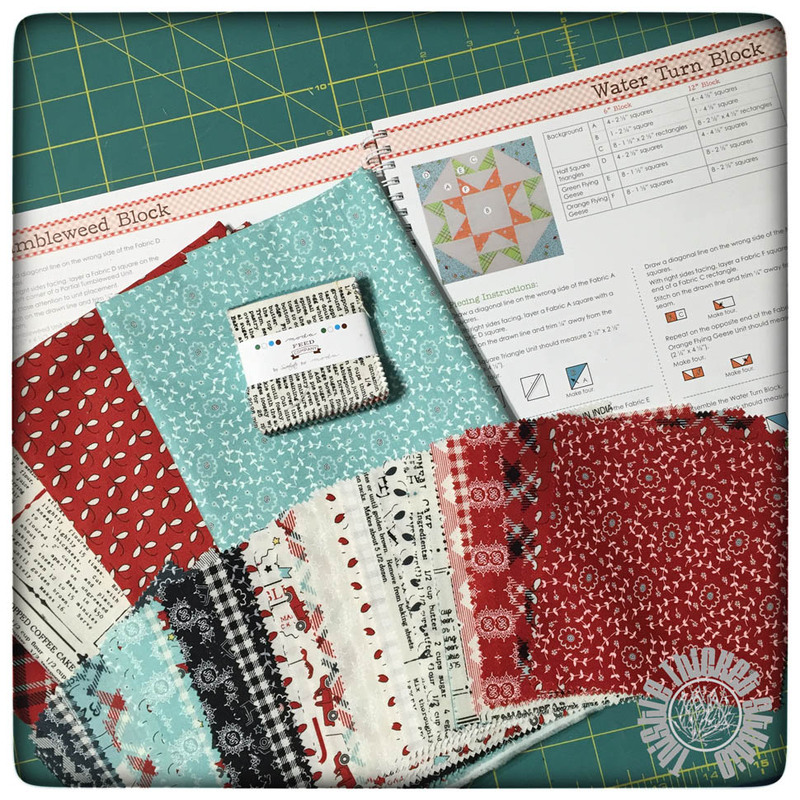 Remember, be sure to stop back by on Friday to check out my Water Turn block, the extra project I made using the block, and for that awesome giveaway (hint: Lori just came out with a new notion that Seams Sew Easy to use)! Bless his heart, the hubby tried to help out taking photos outside. Between the shadows, wind (well, it is Kansas) and the wonky holding, it just wasn't working - but I wasn't super happy with the lighting inside either. This quilt started with a 48" block and then I added borders for a finished size of 62" x 62". My Thistle Thicket Crossing pattern provides cutting instructions for 60" and 72" blocks also. 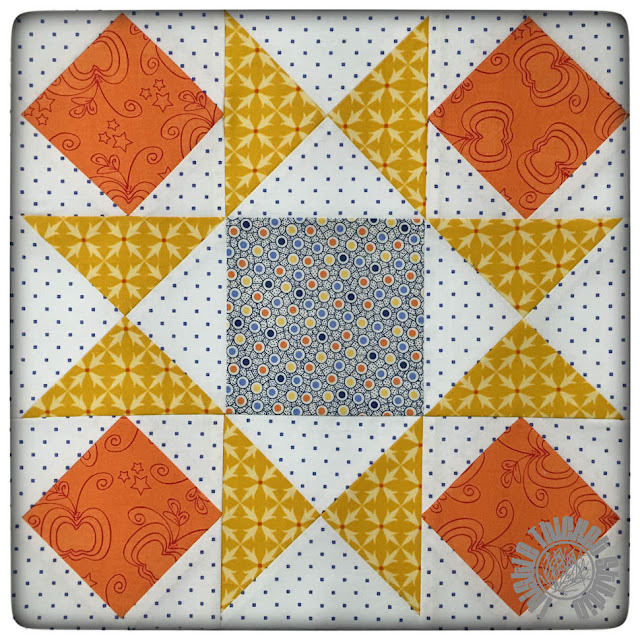 These bigger block quilts are way easier to piece than that 12" block! I spent more time than I planned on quilting this (hence the reason why I'm posting this a week later than I promised), but I love the results! I fussy cut the border so that I had one full circle chain around the outside of the quilt. 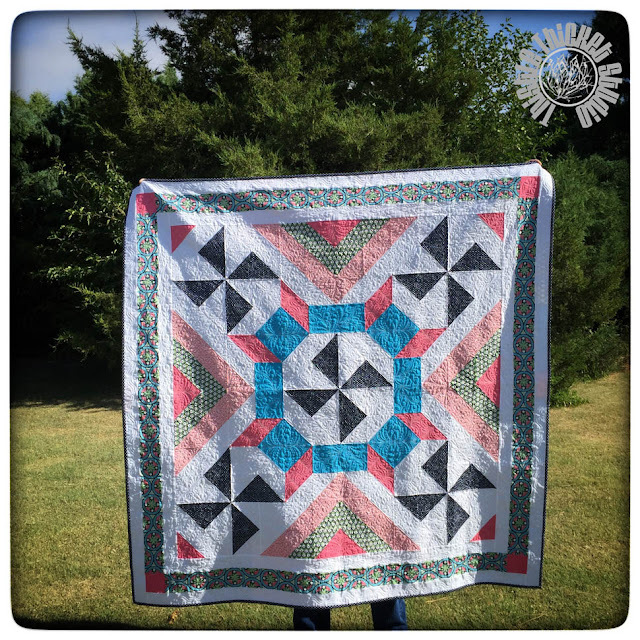 I just fell in love with this particular print from the Pedal Pushers collection by Lauren & Jesse Jung for Moda, and it dictated the color palette for this quilt. Don't you just love turquoise, pink, green and navy together! Since I fussy cut the border, I ended up short of fabric for the backing and had to piece my scraps together. I really like the finished result though. I was really excited at how closely centered I was able to get the backing! And I even remembered to make a label - that doesn't happen very often! When making the big block quilt, you will get a bunch - 116 to be exact - of extra half square triangles if you sew your trimmed corners. 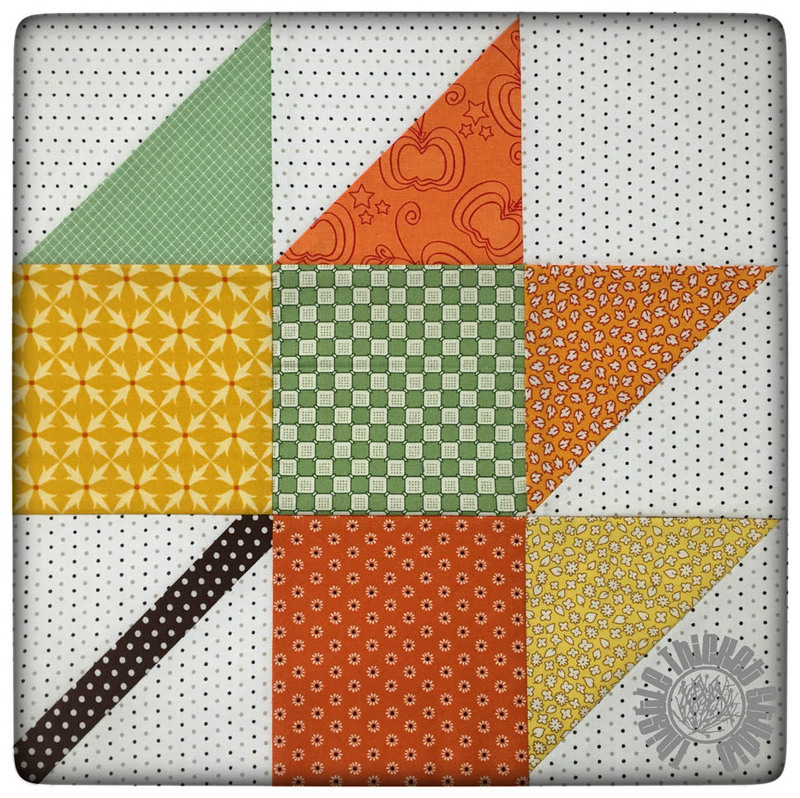 I'm playing with ideas for another quilt using these blocks. Eventually I'll share a companion pattern using those trimmed corner HSTs. Who doesn't love an idea for the leftovers! 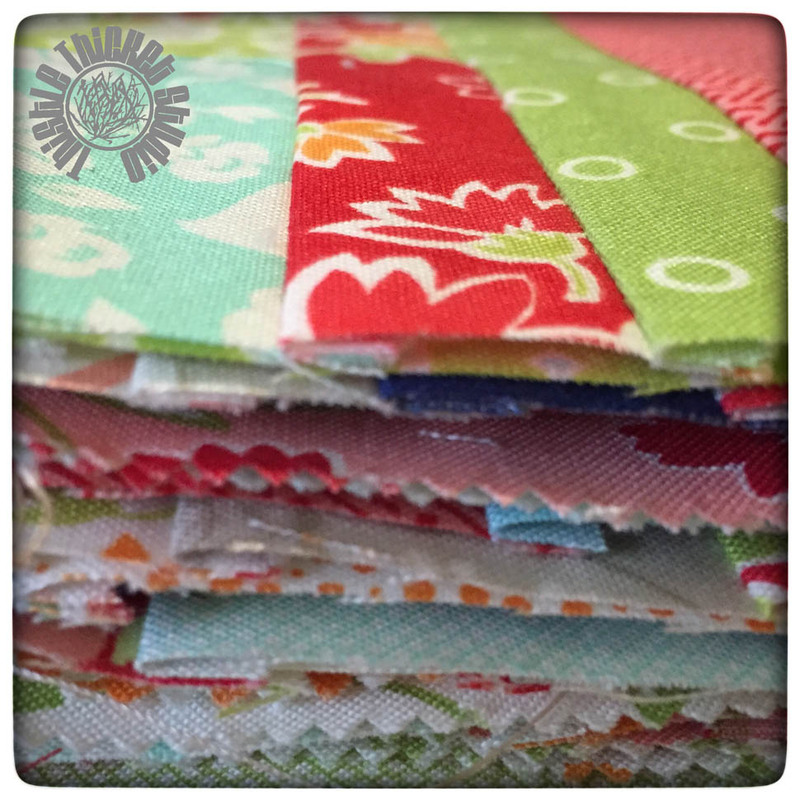 As they say, no rest for the weary (quilter)! 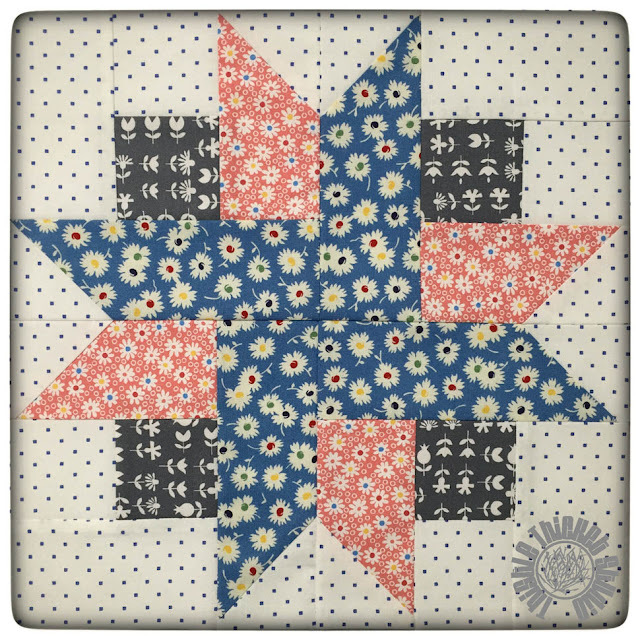 I better get back to my sewing machine to finish up my project for my turn on the Farm Girl Vintage Sew Along next week! 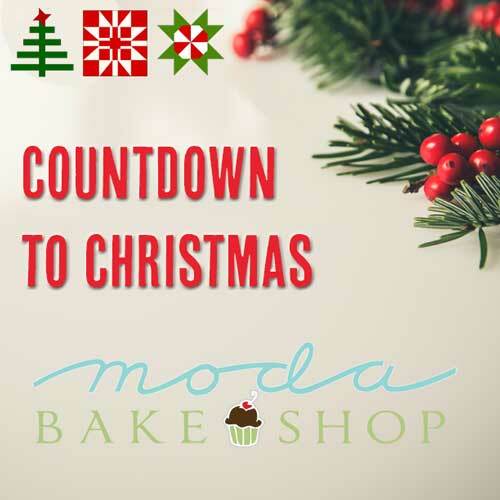 Be sure to stop back by next Friday! 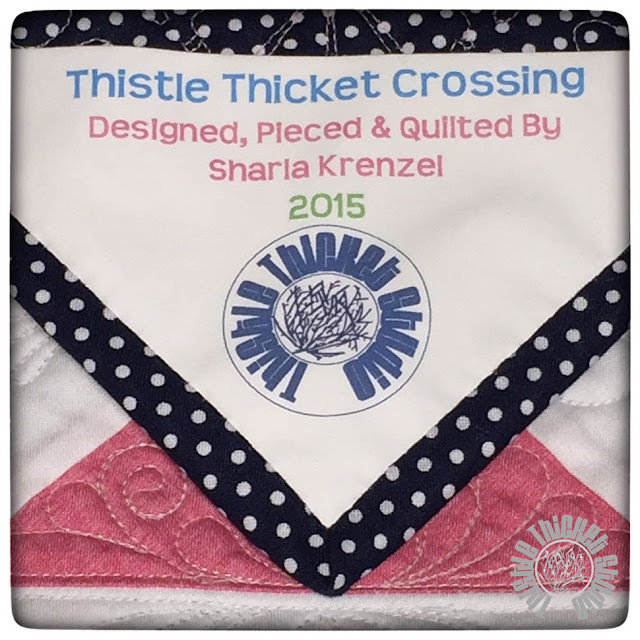 I met Jinger online through the 2015 New Quilt Bloggers group. Meeting new quilters from around the world is one of the benefits of this blog, so it was fitting that someone from the blogging world won. Jinger was in my blog critic group and her comments helped me revamp my blog appearance earlier this summer. Thanks! Thank you to everyone who entered the giveaway and thank you for all the support during my first year of blogging!!! Looking forward to more adventures and getting to know you all better! Have you entered my 1st Anniversary Giveaway celebrating one year in this worldwide blogiverse? Get the details on how to enter here. Giveaway closes tonight at midnight eastern standard time! Hurry & Good Luck! Now for the giveaway deets! 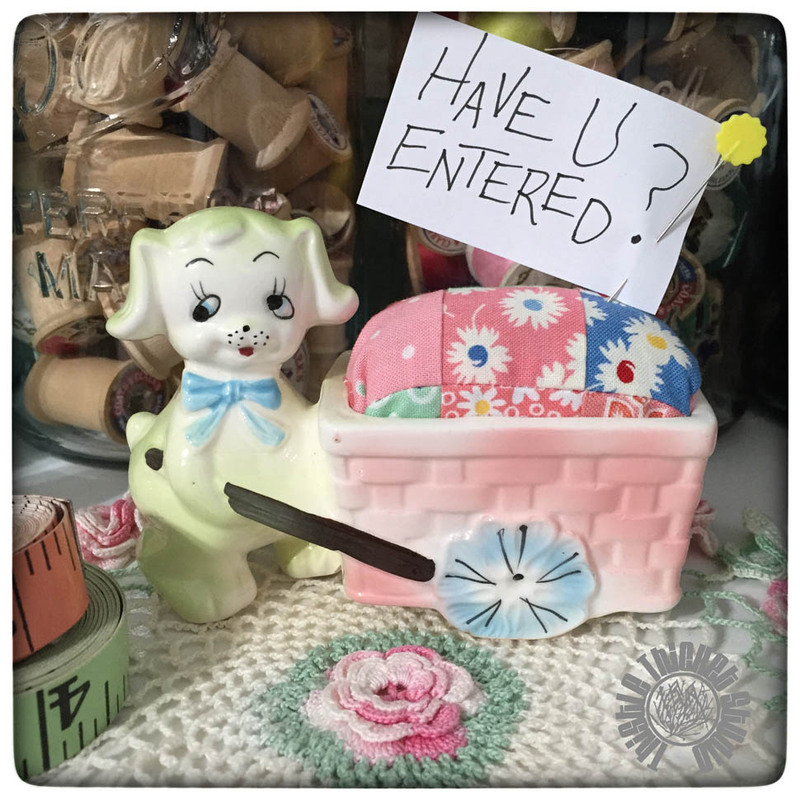 This giveaway includes a vintage 50's planter pincushion featuring a doggie pushing a cart (so cute!) and a vintage button and typewriter key necklace made by yours truly, plus a Shannon Cuddle Charm Pack containing 20 5" squares of Maddening Monochromatic. Liking my post about this giveaway on Instagram, leaving a comment by tagging two friends, and following @thistlethicketstudio on IG. 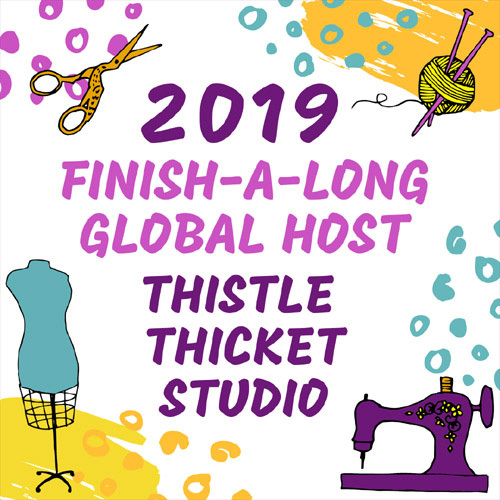 Reposting the giveaway post on Instagram and tagging me @thistlethicketstudio and using the hashtag #thistlethicketgiveaway. Following my blog on Bloglovin'. Giveaway will close on Sunday, September 13 at Midnight ET. I'll announce the winner on Monday. Good Luck! I've come a long way since that first post. I hope I continue to learn and grow, and I hope you'll join me on my creative journey! After a busy week of prepping for the Fabri-Quilt New Block Blog Hop, it was nice to spend some time sewing and crafting a little this week. It's Week 18 of the Farm Girl Vintage Sew Along! What?!? Week 18!!!! This summer has flown by, hasn't it? 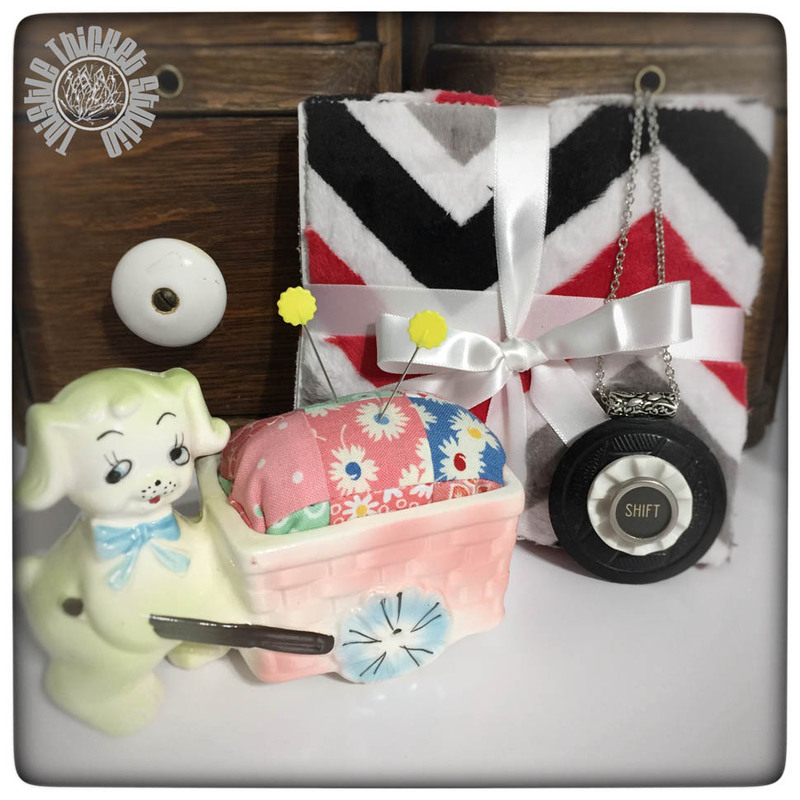 That means my week to be featured in the Farm Girl Vintage Sew Along - September 25th - is almost here! I better get in gear. 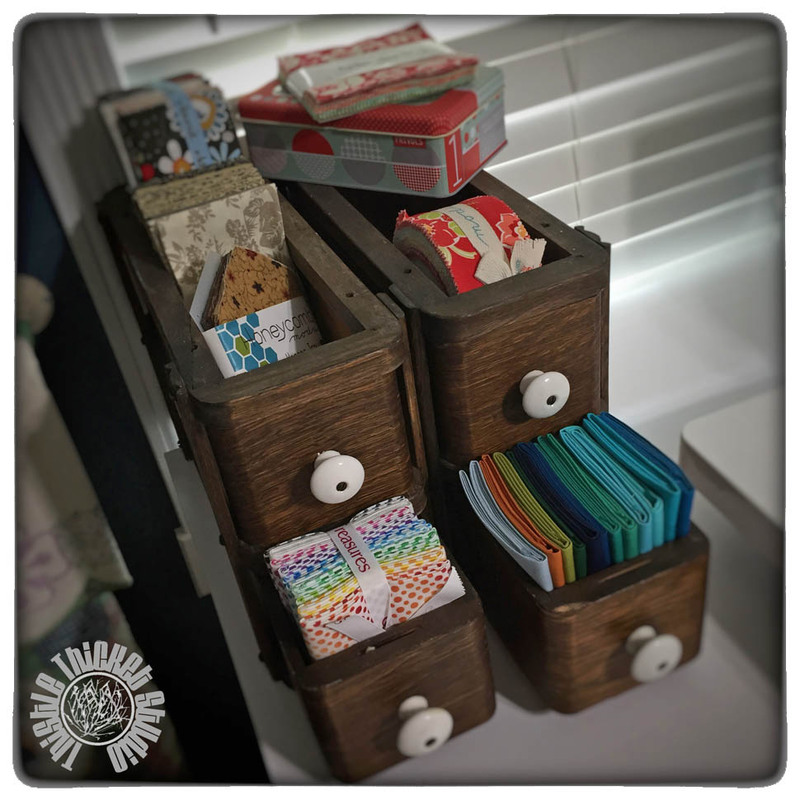 I managed to made a few crafty projects this week too that have been on my list. All small projects and so fun to make. 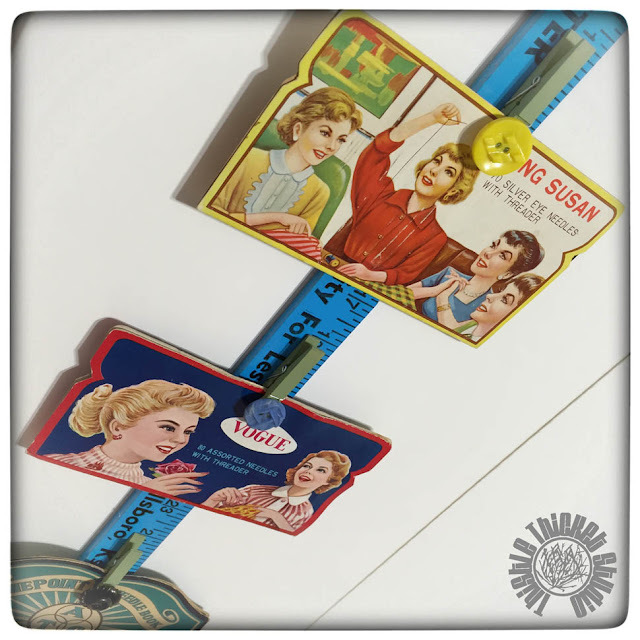 I had this yardstick hanger idea in mind ever since I came home with these vintage needle books. 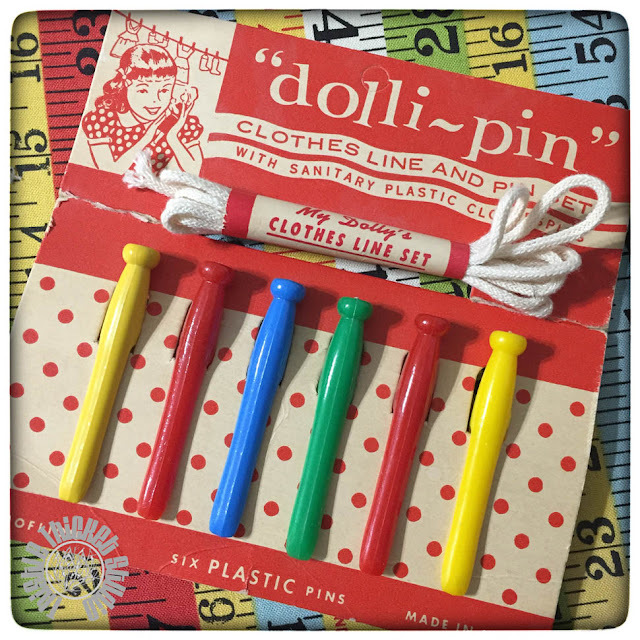 A yardstick, small clothespins, green paint, vintage buttons and hot glue was all it took. TaDa! 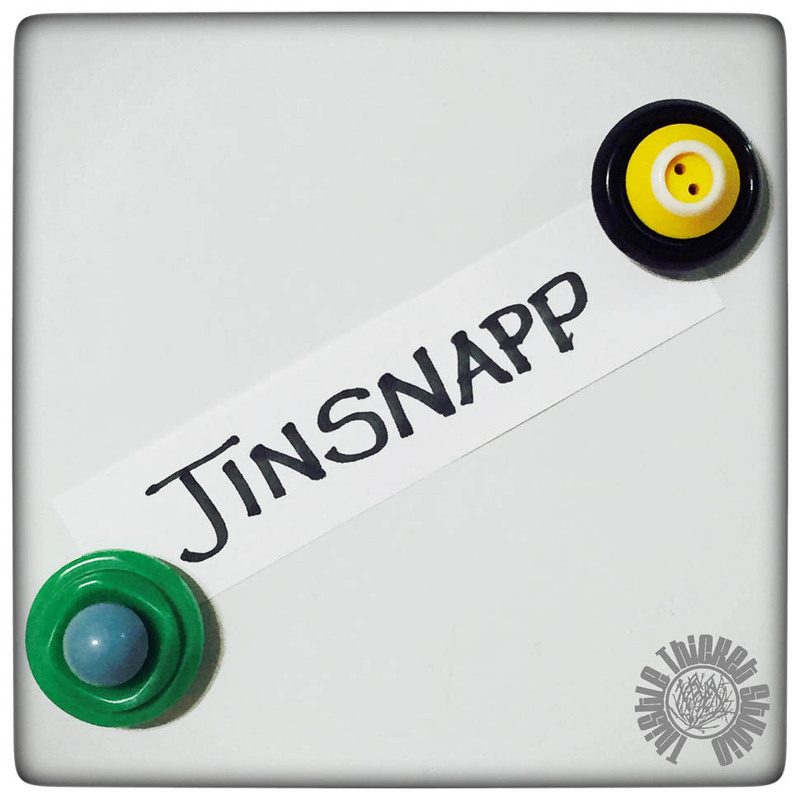 While I had my jars of buttons out, I made a few vintage button magnets too! My mom has been cleaning out her clutter and I have benefited with a few goodies, including six antique sewing machine drawers! Four of them now hold some of my precuts and sits on my sewing table. 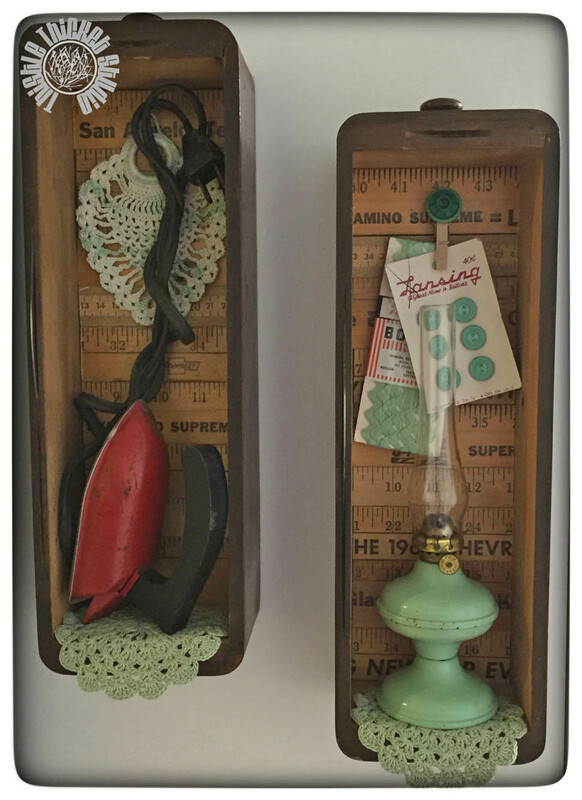 The other two were dressed up with some yardsticks, hung on the side of one of my storage cabinets in my studio and filled with vintage things. Love it! 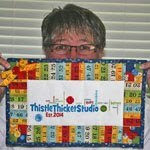 I celebrated my birthday last week with some quilty peeps, so fun to get together! I just had to share these cute little vintage clothes pins, one of the gifts I received. Love them and thank you! 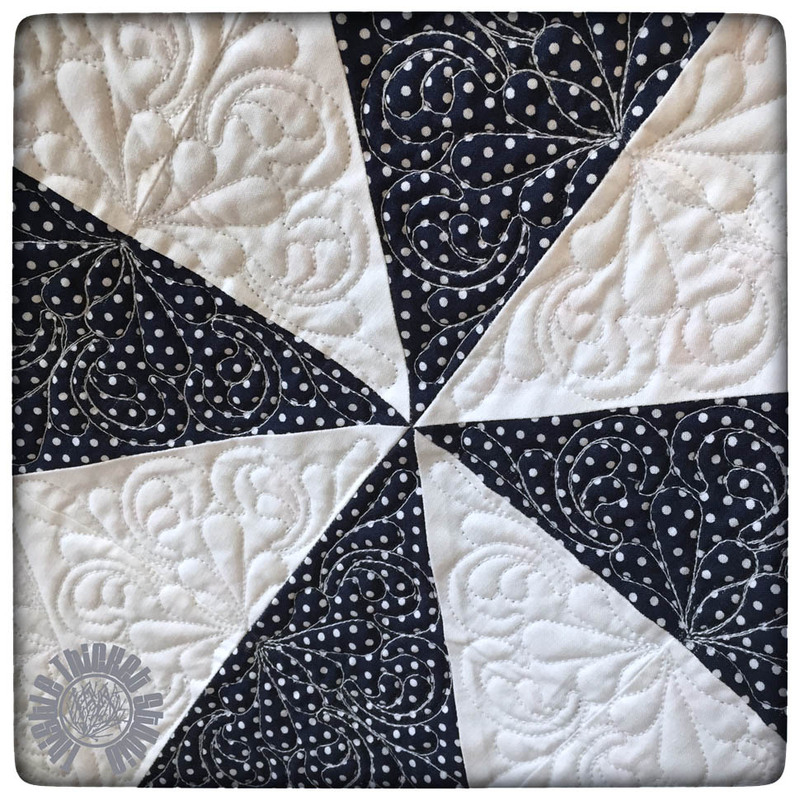 I also was able to sneak in a little quilting time on my super-sized block quilt I designed when working on my Fabri-Quilt block. 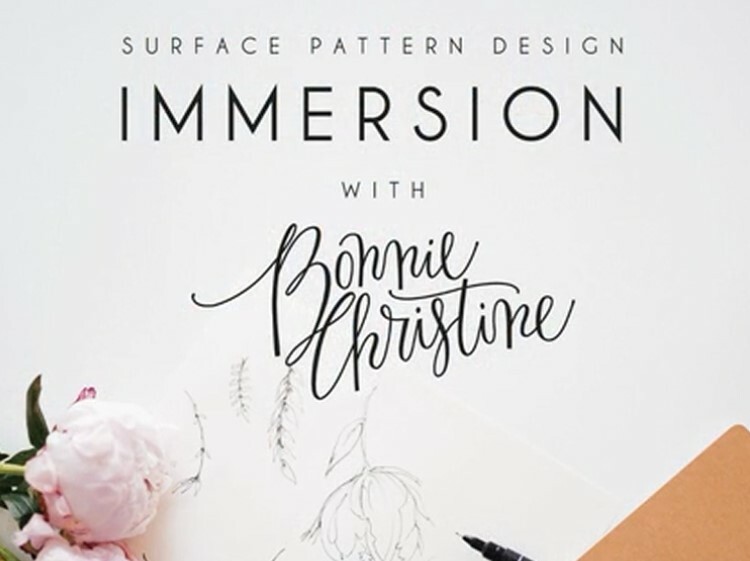 I will debut it next week with a free pattern - so stay tuned! P.S. 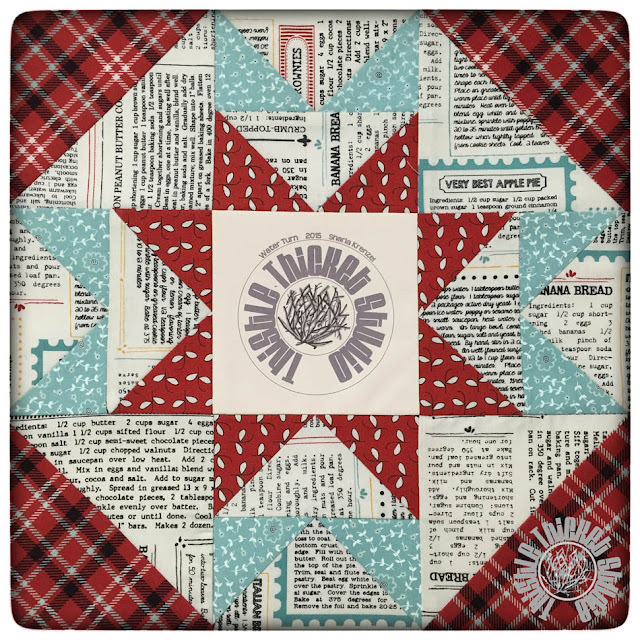 If you missed the Fabri-Quilt New Block Blog Hop, you can grab all the links on my Fabri-Quilt New Block Blog Hop post and be sure to get the free pattern for my Tumbleweed Crossroads block. P.S.S. 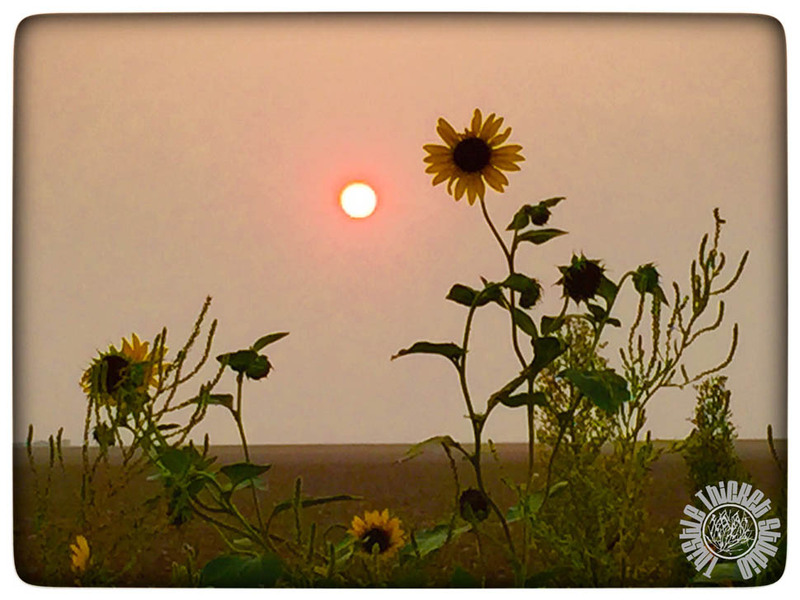 The sunsets have been amazing this past week due to the smoke in the atmosphere from the Northwest wildfires. Although a sad situation, they have produced some spectacular views in western Kansas. I only wish I could capture them better in photos.